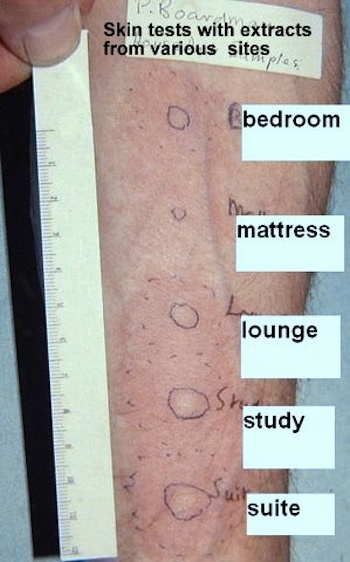 Below are photographs of allergy testing for common indoor allergens, including dust mites. 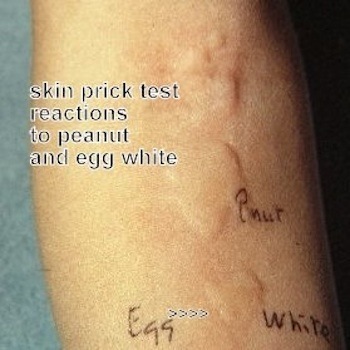 The photographs are examples from case studies carried out by the late Dr Harry Morrow Brown and demonstrate the results of skin prick testing in allergy, a common clinical procedure used by doctors to identify triggers to avoid. 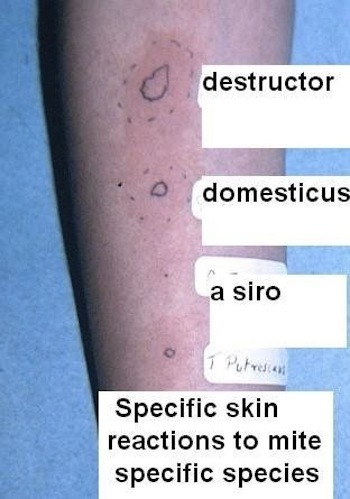 Allergy testing, such as this, is used in conjunction with a detailed medical history of the patient, including family background. The photographs demonstrate the quality of care needed in diagnosing and treating an allergic condition. In his early work on sensitisation to mites from house dust, Dr Morrow Brown successfully used dust mite extracts to reduce allergic reactions. In his written words, "Perhaps the most important contribution is that these testing materials have led to the successful hyposensitisation of patients with house-dust allergens, and some patients no longer required steroid therapy after dependent for years. (Brown,1968)". 'Role of Mites in House Dust', BMJ, 1968, 3, p646-668. Quotes from Dr Morrow Brown "I have carried out research projects in allergy and in aerobiology for over 50 years"
"My objective has always been to find the cause rather than suppress the symptoms with drugs." Reactions to various dust mites that inhabit the indoor environment. This patient was more sensitive to storage mites than house dust mites.. Investigating the common triggers of 'suspected' allergy from the patient's environment. Skin prick testing for food allergens. A procedure only done in a controlled clinical setting. 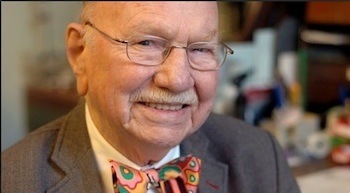 Dr Harry Morrow Brown's informative website continues to be available www.allergiesexplained.com. 'Rhinitis Management Guidlines', Third Edition, British Society for Allergy and Clinical Immunology, ENT sub-committee, 2000, Martin Dunitz ISBN 1-85317-969-8.